CS GAS Records :: CsGASRecords Cinderellaman Becomes Part Of A ‘Desolat Experience’. CSGASRECORDS CINDERELLAMAN BECOMES PART OF A ‘DESOLAT EXPERIENCE’. Cinderellaman a resident for Ec-lectricity is expected to bring his distinctive techno flair to the event. His love and passion for techno music coupled with his innovative mixing and ear for a floor filler guarantees clubbers an explosive set. This year alone has seen csGASRecords Cinderellaman play bookings around the UK and internationally as well as the world renowned GlobalGathering thus earning him the coveted billing alongside globally acclaimed Desolat label DJs Loco Dice and Martin Buttrich. Ec-lectricity are proud to present a "Desolat Experience" a showcase of the Desolat Record Label. Known for hosting some of the biggest and best techno nights around the world, from huge beach parties in Barcelona to the Berlin Love Parade and their nights at Ibiza’s Amnesia, their consistently excellent releases have seen them established as one of the most vital and relevant labels on the scene today, regularly played by the likes of Ricardo Villalobos, Richie Hawtin and Carl Cox. 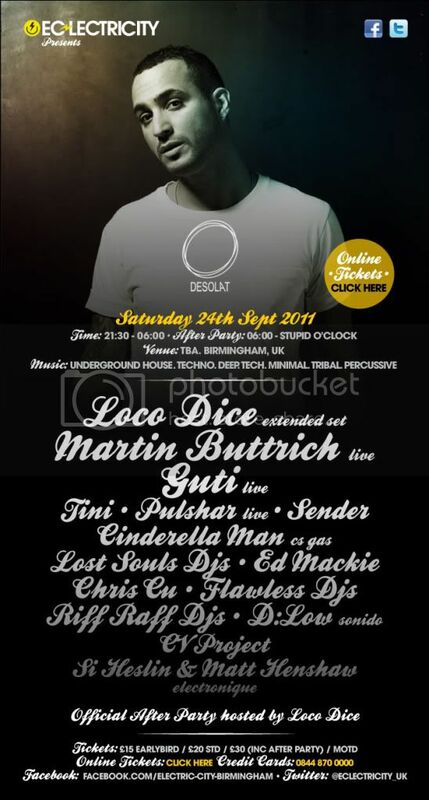 Desolat label boss LOCO DICE, one of the most in demand DJ's on the planet headlines this very special showcase where he will be joined by fellow Desolat boss, MARTIN BUTTRICH. It's rare to see these two on the same line-up, let alone the fact they will be joined by fellow Desolat artists, GUTI and TINI all of which are some of the most hotly tipped acts on the underground house and techno circuit. It's a huge coup to have all of these act's under one roof for one night only. The venue will be announced in the next week or so - watch this space! It's pretty special! And if that wasn’t enough, LOCO DICE is OFFICIALLY hosting this year's after party. Last year saw Loco Dice and Dubfire playing an inpromptu back to back set until the early hours. It went down in history and no doubt this will too! *Please Note - after party tickets are only available for main event advance ticket purchasers. After party only tickets are not available.